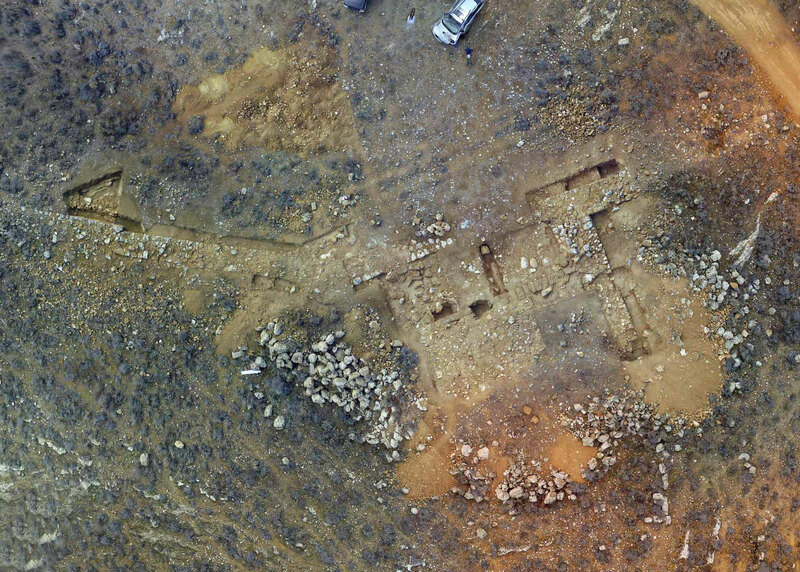 New finds came to light during this year’s excavation season at Agios Sozomenos, within the framework of the Agios Sozomenos Survey and Excavation Project (ASESP), under the direction of Dr. Despo Pilides, Curator of Antiquities. The excavations lasted from 11 September to 27 October 2017 and focused on the Nikolides plateau, so as to investigate the fort, while in the second half of the same season, a new excavation was initiated at Ampelia, on a small hill, where in the 2016 survey, walls were noted on the surface as well as large quantities of pithos sherds. High resolution images taken in 2013, showed an enclosure wall measuring 920m. An isolated trench within the perimeter wall in the northeast of the site bisected an impressive wall of dry, rough ashlar construction, preserved to a height of 1.20m, which stands in marked contrast to the rubble masonry otherwise utilized in these sites and characteristic of the period. This year’s excavations aimed at investigating the plan of the structure, its chronological span and, hopefully, its function. Excavation on the south part of the ashlar wall found the year before, revealed a huge pile of rubble, the result of a destruction caused by the use of mechanical means. The removal of this debris at a particular point revealed part of the south facade of the tower. One very worn smashed vessel with horizontal handles, possibly imitating a White Slip vessel was found. The SW corner of the tower was also revealed, interestingly abutting the circuit wall but not exactly tying in with it. It seems, therefore, likely that the tower was an addition and did not belong to the original construction of the wall. Further excavation revealed the plan of the tower, 15×7.5m, built of large rectangular ashlars placed horizontally on top of each other and smaller stones held together by a reddish mortar filling. The NW corner of the tower was also investigated; the modern disturbance reached as deep as its foundation, since the cornerstone is missing from its original position. The original circuit wall is very well preserved round the plateau except at one point, where sadly, it was cut off with a bulldozer to make a new access road. It is made of rectangular stones placed in layers and filled in with rubble, measuring at least 3.20m in width at some points. The question as to whether there were internal subdivisions, was easily resolved, as at two places, substantial walls adjoining the circuit wall and extending into the interior of the fort, were found. Its extension to the south is clearly visible and further excavation next year, may reveal the gate on the more accessible SW side of the plateau. Further excavation on the East part of the circuit wall also clarified its outline and construction. At some point, the circuit wall on the NE seems to be forming a recess; the stones of the line of the wall do not tie with those of the recess, a fact which may signify that a small modification may have been required at some point. The width of the older part is 2.05m and of the rebuilt part, which was slightly moved towards the edge of the slope, was 1.80m. Interior walls were also revealed on the NE side, which were constructed above bedrock and seem to indicate a structure with rooms—however, it may be possible that these walls pre-existed and are a little earlier than the wall, but this can only be clarified by further expansion of the excavation on the interior of the wall next year. Not a single object was found during excavation of the Nikolides fort. In the layer of silt just above the floor, possibly representing abandonment, only small sherds of ceramics were found consisting of White Painted VI, White Slip I, Red Slip, Plain White, White Slip II and some Mycenaean ware and indicating a chronological range within the Late Cypriote I and II. Of particular importance are the possible Cypro-Minoan signs that have been observed painted or inscised, on ceramic sherds and on pithoi, which are currently under examination. Excavation continued at the site of Ampelia, on a small hill, at a distance of approximately 350m across from Dzirpoulos (excavated between 2013 and 2016), at a point where walls were visible on the surface with huge amounts of pithos sherds. Although the two sites are on either side of a stream, it is almost certain that they belong to the same settlement. Excavation brought to light a building consisting of a large rectangular room, 11.6x 3.3m, with a fine gypsum plaster floor, with an entrance on the south that led into a possible courtyard with a cobbled floor. In the room, 9 stone bases were found standing in their original position on the east side of the room , where large pithoi of size 2 or 3 were placed. The pithoi were found broken on the floor. On the western side, there were more stone bases with pithoi but at least two large stones seem to have fallen from above, crushing the pithos vessels below. The large pithoi in the pithos room, ranged from a minimum of 9 to a maximum of 16 and must have held a considerable amount of produce. On the west part of the room the plaster floor was burnt and a thick layer of ashes, about 6cm in depth was found, as a result of a fire that caused the destruction of the building. In the same area, the roof was found collapsed above the same layer of ashes. A rectangular stone with a pivot hole may have supported a post or a door. In the next area to the west, another wall, parallel and adjoining the west wall of the pithos room was found, possibly representing a later phase. The floor was not so well preserved but it was obvious that a mixture of plaster covered the bedrock surface and, a number of circular holes were noted. Some of them may represent tree holes and their roots causing crevices in the bedrock, but others are postholes. One of them, on the NW side, contained upright diabase stones, while others, lined with gypsum may have been holding storage jars in place. Traces of heavy fire were also noted throughout the western part of this room; the subdividing walls were destroyed in this process and only small fragments of them were preserved. It is not clear therefore, whether this was originally a larger room, which was then subdivided in the later phase, into two smaller long rooms, because the fire and destruction that followed, obliterated this evidence. Pithoi were found burnt, throughout the area, and, again the collapsed roof sealed the burnt layer at some points. On the south side of the same room, smaller storage jars with incised and stamped decoration were found in association with stone grinders, a small bronze blade, diabase tools and a gaming stone. More gaming stones were found in reuse in the wall construction and some were found strewn around the surface of the small hill. A stepped limestone object was also found in the layer of destruction. Apart from a few broken grinders, not a single object of use was found, except for fragments of ceramics and the pithos and storage jars which were too large and heavy to be moved and were left behind. Everything else was taken away on abandonment, prior to the fire destruction. Two trenches on the east slope of the hill confirmed that cultivation had destroyed the remains on the slope of the hill. The huge amounts of stone and cultural material extending up to the next hillock indicate that ploughing had carried it all away. Nevertheless the site is extending from the foot of the Barsak promontory to the confluence of the two rivers Alykos and Yialias. Its size and complexity provide evidence for the urban nature of the settlement. The ceramics are fine, well fired and of high quality, in contrast to those found at Nikolides. Base Ring jugs and bowls, White Slip I ad II early, some White Painted Wheelmade, Mycenaean sherds as well as Red Slip and Black Slip, Red on Red or Red on Black, Monochrome and small quantites of cooking ware, indicate that apart from the storage jars and the pithoi in the stores, the majority of ceramics were small table ware shapes. Thus it seems that this was the storage area, where produce was concentrated, while the workshop area was on the lower slope to the south, at Dzirpoulos. Much work still needs to be done before we are in a position to refine our understanding of the social organisation of the region and the sequence of events. However, the general picture emerging from the above survey and excavations indicate, tentatively at present, that the fort at Barsak, a formidable double circuit wall with a deep ditch on the exterior, was contemporary with the first phase of the settlement at Dzirpoulos. As the Late Bronze Age progresses, the focus of settlement shifts away from the plateau and into the fertile valley below. Barsak was abandoned and a new fort was built at Nikolides, which needed to be strengthened during its lifespan, by the addition of a well-built ashlar tower. Ambelia in particular, situated at the confluence of the Alykos and Yialias rivers and on the communication route to the east, flourishes during this period and the building on the hill, obviously supervising the entire valley and controlling the produce, was established, Gradually the convenience of immediate access to the agricultural fields and the transportation routes provided by the rivers seems to have become more important. It appears, however, that before the end of the LCII, not even the fort at Nikolides was adequate enough to protect the settlement from the impending danger, as the inhabitants were forced to flee and abandonment followed. The robust structures on the plateaus and the concentrated amount of storage at Ampelia, the extent of the site and the strategic placement of all these components, presuppose considerable planning and control over human and material resources. The pottery, particularly at Ampelia and Dzirpoulos does not indicate seclusion and, proximity to the mines and on the route to the harbours must have had a major role to play, until a force majeur, led to its collapse and abandonment. During the excavation, soil samples were collected for the retrieval of organic material and the samples were processed by flotation. The archaeobotanical remains, studied by Dr Evi Margaritis of the Science and Technology for Archaeology Research Center (STARC), the Cyprus Institute, are carbonised and they mainly derive from the burnt area around the large storage vessels. The plant remains consist of a variety of seeds, such as barley, figs, grapes, and almond. The grapes most likely represent raisins, as several pieces of fruit pulp with visible grape pip inside are present in the assemblage. On top of the cereals, fruits and nuts few segetal and ruderal plants such as goosefoot – (Chenopodium sp.) and viper’s bugloss (Echium vulgare) are present which most likely represent by products of crop processing activities or they were deliberately gathered from the surrounding landscape. The plant remains most likely represent the contents of the storage vessels which survived charred as a result of the destruction of the site by fire. More specialized studies on the contents of the pithoi will be conducted in the near future. The material from Ampelia is of great importance as it represents one of the very few archaeobotanical assemblages from the Late Bronze Age, and together with the evidence from Dzirpoulos, a few hundred meters from the site, will facilitate the reconstruction of the agricultural practices and economy of the period, for which our knowledge is extremely limited.